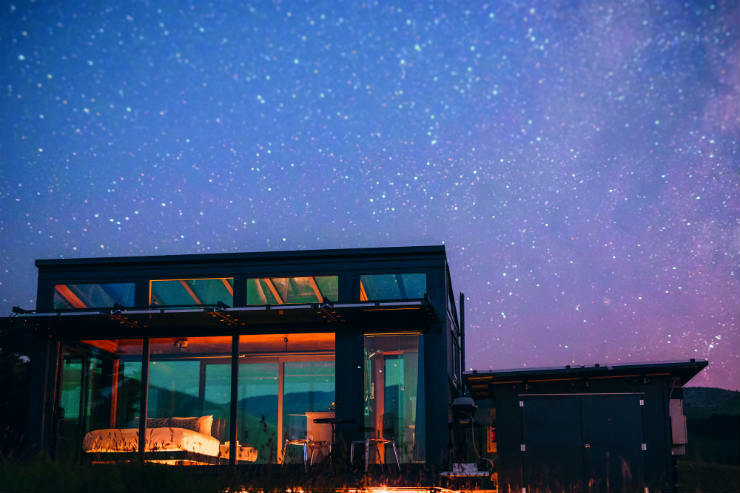 From eco-friendly glass pods to gravity-defying treehouses, New Zealand is brimming with unique accommodation options for clients to bed down in, says Abra Dunsby. Clients will feel like they’ve stepped into a fantasy world with a stay at The Boot, a cute one-bedroom cottage located just outside Nelson on South Island. Book it: The Boot is offered as part of a tailor-made package by Silver Fern Holidays, starting from £175 per night based on two sharing, including breakfast. Clients looking for an off-the-grid experience can snuggle down in an all-glass PurePod. The pods have no televisions or Wi-Fi, instead guests are given binoculars or a telescope for bird-watching and stargazing. The eco pods run on solar power and use filtered rainwater, but luxurious linen, underfloor heating and power showers ensure comfort remains paramount. Six PurePods are scattered across remote, scenic locations on South Island, including. coastal Atatu PurePod, north-east of Christchurch, and Greystone PurePod, less than an hour’s drive north of Christchurch, perched above a winery in Waipara. Book it: Austravel can arrange a stay at PurePods from £278pppn as part of a tailor-made New Zealand multi-centre trip. Perched high above the treetops Hapuku Lodge offers bird's-eye views of the Kailkoura Seaward mountain range and the Pacific Ocean. Clients can choose from three one-bedroom treehouses or two family treehouses, each with a private hot tub, balcony and fireplace. Food is prepared by Hapuku’s executive chef, Fiona Read, a former MasterChef finalist. The proximity of the treehouses to the famed eco-marine town of Kaikoura means it’s easy for clients to enjoy activities such as whale-spotting and swimming with dolphins. 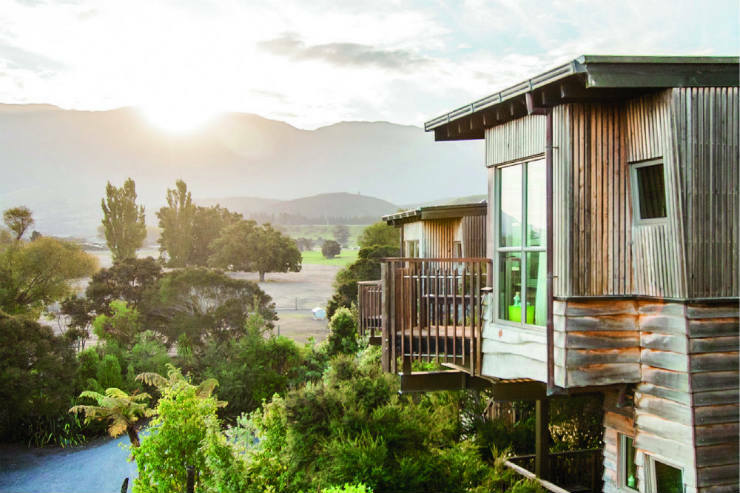 Book it: Travel 2 offers a three-night stay at Hapuku Lodge Kaikoura on full-board, staying in an Upper Branch Treehouse. Prices start from £2,759pp for a nine-night New Zealand trip, based on travel from May 6-20, 2019. 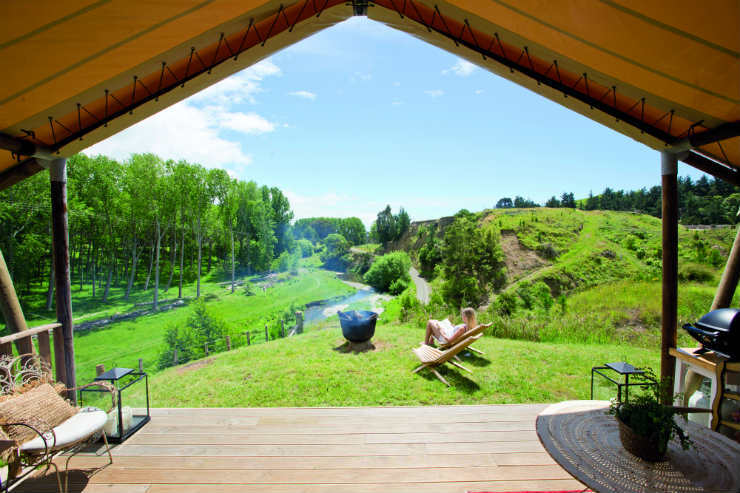 Clifton Glamping’s luxury tents look out across the Maraetotara river and countryside, with the beach town of Te Awanga a five-minute drive away, and Havelock North, Hastings and Napier a 20-minute drive away. Each African-style safari tent features a semi-outdoor kitchen and a large outdoor deck, plus an outdoor shower and bathtub with excellent views of Clifton. The tents are situated on a 2,000-acre working farm, near local wineries, cycle tracks and Cape Kidnappers – home to its gannet colony and famous golf course. Book it: A stay at Clifton Glamping starts from £154 per night with a minimum two-night stay. The Lindis sits on South Island’s Ahuriri Valley, surrounded by 6,000 acres of wilderness and three conservation parks. Built of timber and glass, the property is composed of five suites, kitted out in sculptural, minimalist handcrafted furniture, and offering impressive views from its designer baths. Guests can try out everything from hiking and mountain biking to horse-riding and worldclass fly-fishing nearby. Book it: Audley Travel has a 21-day trip from £6,325pp based on two sharing, including all flights, accommodation, including two nights at The Lindis, plus transfers and car hire.